Having been unceremoniously unearthed from its underground layer in Forbidden Valley, the ancient Nemesis monster is twisted and angry - can it be contained? Nemesis' track is half buried in a pit, meaning although its highest point is only 40ft above ground level, its largest drop is a little over 100ft. This quirk came about thanks to local planning legislation which prevents Alton Towers from building any ride above tree height. Thus, the ingeneous solution ride designer John Wardley came up with was to place the rollercoaster in a pit and theme it around an alien creature that had been accidently unearthed during building work in the park's Forbidden Valley area. Riders board the rollercoaster inside Nemesis' enclosed station, and can choose between queuing for the front row or sitting in any of the remaining seven rows of four. After the restraints are checked, the floor is lowered and the train leaves the station, turning sharp right and engaging onto the lift hill. At the top of the lift hill the train takes a 180 degree left hand turn and swoops down towards Forbidden Valley, corkscrewing as it goes. An intense positive G turn follows, before the train enters a zero-G roll over the roof of the station. If they are able to look around at this point, riders find themselves in a chasm with red coloured waterfalls flowing into a red blooded lake below. This is home to Nemesis' third inversion, a dramatic vertical loop that sends riders' legs flinging into the sky. Passing through a tunnel, there is one more corkscrew before an intense run barely skimming the rock walls that takes the train and its riders careering into the final brake run and back into the Nemesis station. Although now well over twenty years old, Nemesis is still regularly ranked amongst the top rollercoasters in the world. 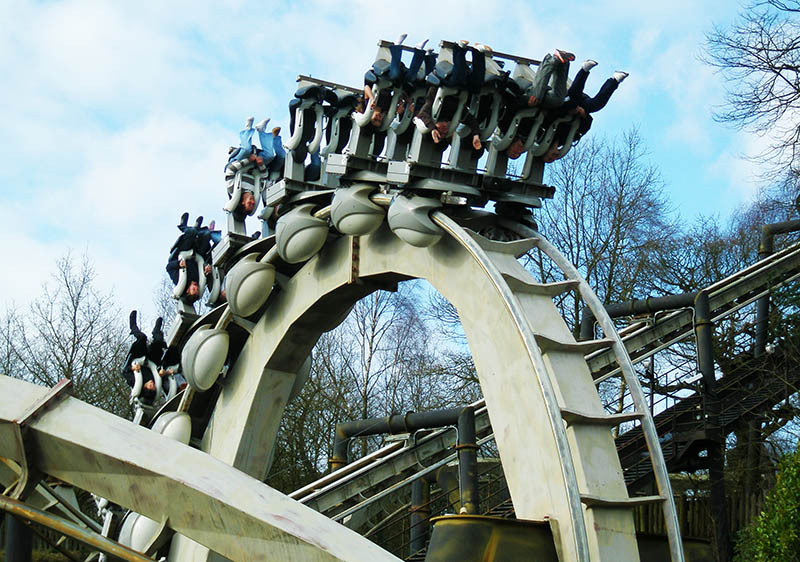 It offers the most intense experience of any of Alton Towers' rides, and was one of the first inverted coasters to be built. Eighteen years after it opened it inspired a second ride in Forbidden Valley, the much less successful and ultimately underwhelming Nemesis Sub Terra which sought to expand on the story behind the Nemesis legend.